Eating healthily need not break the bank. Here are four tips from Chelsea Arceri, our Accredited Practising Dietitian. It does take a little more time and effort, but it means you know exactly what you are eating, so you can make healthier choices and save money at the same time! Fruit and vegetables that are in season are always cheaper. You can also buy fruit and veggies that are on special, and then find new and exciting recipes to cook or prepare them. Doing so is a great way to save money, while also helping you to increase the variety of foods you eat. Another tip is to buy your produce in bulk and freeze it. Many fruit and veggies freeze really well and doing this, means you may not need to the pay higher prices to enjoy them when they’re out of season. Many cereals contain added sugars and high GI carbohydrates, which cause your blood sugars to spike and drop erratically. Rolled oats are not only a great source of fibre, but they also don’t have any added sugars, as well as being cheap to buy. Rolled oats are a perfect breakfast option in the form of porridge or overnight oats. Just remember – don’t load it up with brown sugar! Instead, to sweeten, try using cinnamon, fruit or a teaspoon of honey or maple syrup. Legumes – such as lentils, beans and chickpeas – are full of vitamins, minerals, protein and fibre, making them a great alternative to meat. As an added bonus, canned or dried legumes are also much cheaper to buy than meat; in fact, you can pick up a can of chickpeas (serving two people) for less than a dollar! Ideally, aim to include around three serves of legumes in your diet each week. 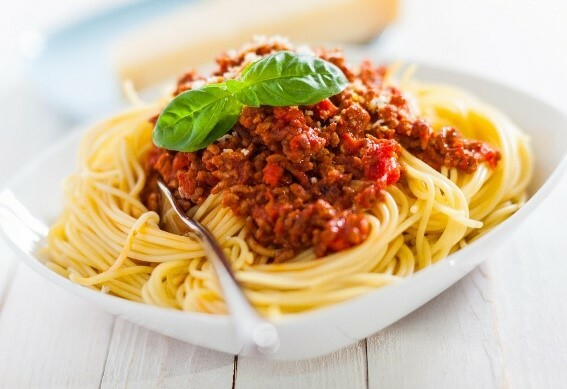 A good way to start is by adding a can of brown lentils to your bolognese sauce (see recipe) – by doing so you’ll save yourself a few dollars and help your body thrive at the same time! If using mince, add it first and cook until brown. Next add onion, garlic, carrot, zucchini and lentils and cook until softened. Next add the passata and season with salt* and oregano. Bring it to a simmer and cook until it reaches your desired flavour and texture. If it is reducing too quickly, place on the lid; or to reduce faster, remove from heat altogether. Cook the spaghetti in a large pot of lightly salted water. For more healthy recipes or to learn more about how to eat well and feel great, contact Chelsea on 5155 8370.